A crop of Fifth Dimension by Jordan Monsell. 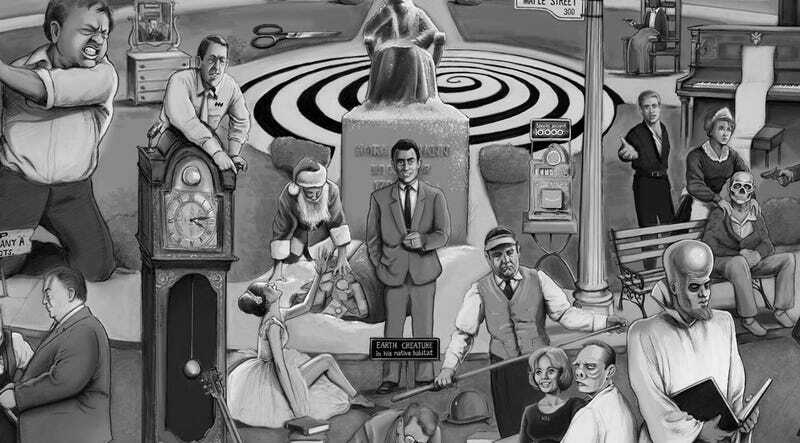 Think you know The Twilight Zone? Time to put that knowledge to the test with a little Where’s Waldo? flair. Artist Jordan Monsell has created a poster containing references to all 156 episodes of the iconic series, which is being rebooted on CBS All Access starting April 1. It’s called Fifth Dimension and will first be available at WonderCon in Anaheim, CA this weekend. Here’s the full piece. “Fifth Dimension” will be available at WonderCon this weekend (Table DL-31) as well as online at Monsell’s Etsy shop: Silhouettes (and Illustration) by Jordan. He will also be at Dark Delicacies in Burbank, CA for a signing on April 14th at 4:00 p.m. PST. Give up on trying to figure out which episode is which? Well, Monsell also kindly provided this spoilery key.